Lets party! 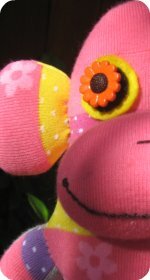 There are lots of fun monkey party supplies for boys and girls parties, 1st birthday or a monkey baby shower. Cake pans to make homemade monkey cakes, decorations, plates, favors, invitations, napkins, hats, balloons, and more. 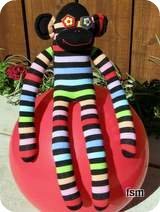 Monkey theme parties are easy to achieve with the help of a few monkey orientated items that you can either buy or add a personalized homemade touch and make your own. 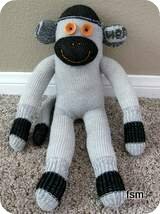 Sock monkey party supplies can include: Personalized book marks, dinner plates, cake plates, thank you notes, place mats, napkins, bag tags, invitations, lollipops, cups, mini magnets, buttons, banners, luggage tags, stickers, zipper pulls, and table covers. Gather or make some of the above and you’ve got yourself a wonderful monkey themed party. Monkey baby shower supplies can include themed blue or pink monkey items. 1st Birthday party supplies are available in pre-made packs blue and pink monkey packs as well as sock monkey red classic and deluxe packs. Keep your eyes open for these. 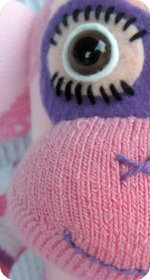 Sock monkey cake: Making monkey cakes can be as simple as having a round cake and creating a sock monkey face on top. If you want to be a little fancier, using a monkey cake pan might be great to use. 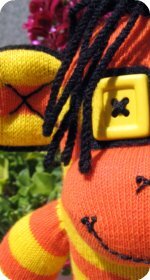 Pin the tail on the sock monkey – just the same as the donkey game but have a monkey instead. Decorate your party room as a monkey jungle, as simple as cutting out large leaves from green card or paper. 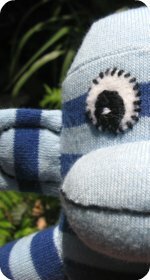 If kids are older you can have each child make their own sock monkey, which they get to keep as part of their gift bag. This is very fun and very affordable if you have inexpensive socks. 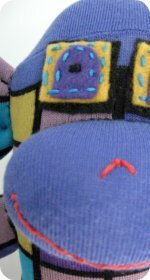 It may be easier and faster on the day if you do all the machine sewing before hand.